It sounds like a simple question: What body in the Solar System is farthest from the Sun? However, when I try to answer it, I find that one may interpret the question in several ways. In this little presentation, I'll try to describe two such interpretations, and the answer to each. In addition, I'll take a "historical view"; that means I'll try to provide the answer an astronomer would have given in the year 1600, or 1700, or 1800, and so forth. Obviously, as astronomers acquired more powerful instruments -- AND more powerful analytical techniques -- they have been able to find objects farther and farther away from the Sun. For most of the discussion, I'll avoid the issue of comets, for reasons that I'll explain later. It's not really fair, so there's a short section at the end in which I allow them to be included in the discussion. One final disclaimer: I am by no means any expert in orbital dynamics, nor am I a member of one of the teams currently searching for new, distant bodies. If I make mistakes, I hope that the real experts will contact me to let me know, so that I can set the story straight. Just what do you mean by "most distant," anyway? Second, I'll use as a reference a list maintained by the Minor Planet Center. Specifically, my starting point is the MPCORB file prepared on 2007 June 29. It contains over 338,000 objects. Right. Now, when I hear the question, What body in the Solar System is farthest from the Sun? I think of two possible ways to answer the question. The difference is one of potential, or maybe patience. What body has an orbit that someday will take it farther from the Sun than any other known body will ever go? What body is farthest from the Sun RIGHT NOW? So, let me try to provide answers to each of these possibilities. In each case, I'll track the answer over all of recorded human history; well, what that really means is "over the past 500 years or so," since the answers only start to change after the invention of the telescope and the mathematical work of Kepler and Newton. Aphelion? What does that mean? The orbits of the Earth and Venus are very nearly circular. Circles are one special sort of ellipse, those in which the eccentricity (abbreviation: "e"), a measure of asymmetry, is exactly zero. Mathematically speaking, a circular orbit can be described as one in which e = 0. The orbit on Mercury, on the other hand, is clearly not a circle; it has e = 0.21. The larger the eccentricity, the longer and skinnier the ellipse. If the eccentricity reaches the critical value of e = 1.0, then the orbit is no longer a closed ellipse, but an open parabola; the body will pass the Sun once, fly off into space, and never return. Let's look at the orbit of Mercury in more detail. The longest axis of the ellipse is called (not surprisingly) the major axis. It always runs through the Sun, which sits at one of the foci of the ellipse. Half of this longest axis is called the semi-major axis, logically enough. The semi-major axis is one of the quantities used by astronomers to define the shape and orientation of an orbit, and is often denoted by the letter a.
perihelion comes from Greek roots meaning "closest to the Sun"
aphelion comes from Greek roots meaning "farthest from the Sun"
Now, if we have a list of bodies and their orbital elements, we can very easily find the one which, at some times in the past and future, attains a distance farther from the Sun than any other body ever does. We simply look for the body in the list which has the largest aphelion distance. Here are the results, over the past few centuries. Are you puzzled by the strange "names" in the list above? If so, you might want to take a brief break to look at an explanation of minor planet designations. J. Ticha. 0.57-m f/5.2 reflector + CCD. rho sin phi' = +0.69176. 353 Nishi Kobe. Observer K. Ito. 0.25-m f/6.3 Schmidt-Cassegrain  + CCD. 360 Kuma Kogen. Observer A. Nakamura. 0.60-m f/6.0 Ritchey-Chretien + CCD. 367 Yatsuka. Observer H. Abe. 0.26-m f/6.0 reflector  + CCD. 388 Tokyo-Mitaka. Observers N. Yamamoto, D. Kinoshita, T. Saito, A. Obara. Measurer I. Sato. 0.50-m reflector  + CCD. 422 Loomberah. Observer G. J. Garradd. 0.25-m f/4.1 reflector  + CCD. 557 Ondrejov. Observer P. Pravec. 0.65-m f/3.6 reflector + CCD. for the NEAT team. 1.0-m f/2.2 GEODSS telescope + CCD. 673 Table Mountain Observatory, Wrightwood. Observer D. L. Rabinowitz. 817 Sudbury. Observer D. di Cicco. 0.41-m Schmidt-Cassegrain  + CCD. 900 Moriyama. Observer Y. Ikari. 0.25-m f/6.3 reflector  + CCD. The final two objects on the list, 2002 RN109 and 2005 VX3, have orbits which are poorly known. Astronomers have measured each one has over a relatively short span of time, so the parameters of the orbit may be incorrect at a significant level. Note that even a very small decrease in the eccentricity of either one could decrease its aphelion distance by a very large amount. Dave Herald provides a nice illustration. He writes that when he computes an orbit for 2002 RN109 using Find_Orb, he finds an aphelion distance of 2085 AU -- very different from the 1190 AU based on the parameters in the MPCORB file. It's clear that we have only very rough notions of the shape and size of these record-holding bodies. This is how impatient people might interpret the original question. Based on what we know, right now, which object is at this very instant the most distant from the Sun? In order to answer it, we need the same compilation of information on the orbital parameters of all known bodies in the Solar System; but we also need a new tool. We can't simply plug a couple of numbers into a simple equation this time, as we did to determine the aphelion distance of each object. Instead, we need to apply rather sophisticated mathematical calculations over and over and OVER again to work out the position of each object at some particular time. I grabbed some code from a project called libnova to do this work for me. I know that the real professionals in this business have their own code; I suspect that many of them have written it themselves. Why start in 1990? It was at about that time that astronomers started searching in earnest for faint trans-neptunian objects (TNOs). Before that time, the most distant object was simply the most distant known planet. So, here's what I found. Note that during the intervals 1930-1979 and 2000-2001, the most distant known object (Pluto and 2000 AF255, respectively) was on the inbound section of its orbit; thus, in some sense, the size of the "known Solar System" was gradually shrinking. And, in fact, it is happening right now: (136199) Eris was 97.0 AU from the Sun when discovered, but is only 96.8 AU from the Sun now, in July 2007. The jets act like very weak rocket engines, pushing the comet slightly and altering its orbit. Due to these "non-gravitational forces", the orbits of comets can change significantly from one passage through the inner Solar System to the next. Comet C/1853 E1 (Secchi) is one of a large number of comets with parabolic orbits. Given that there are sufficient observations of the comet, 91 in right ascension and the same number in declination, it proves possible to calculate a better orbit. Comet Secchi's orbit is hyperbolic, the most hyperbolic of any comet except C/1980 E1 (Bowell). Comet Secchi is in no way associated with Comet C/1664 W1. Which comet has the largest aphelion distance? Which comet is farthest from the Sun right NOW? Let's see what the answers are ... I grabbed orbital elements for comets from one of the sub-pages under the main MPC site; specifically, those listed as Observable Comets. I'm sure that this is only a subset of all known cometary orbits, but it's the best I could find. The names of the final two comets on the list may need a bit of explanation. LINEAR refers to the LIncoln Near-Earth Asteroid Research program, a collaboration between the Air Force and MIT's Lincoln Laboratories. NEAT is the Near-Earth Asteroid Tracking program, run by JPL, with telescopes in Hawaii and on Mount Palomar. These two programs are among the most productive search programs running. From 142 observations 2002 June 6-2004 Oct. 10, mean residual 0".6. I'd conclude that we don't know that aphelion distance of this comet (or, probably, others like it) very well at all; but we can say that it goes very, very, VERY far away from the Sun. Finally, let's try to use the orbital elements of comets with elliptical orbits to make a list of the known comet which is farthest from the Sun right NOW, over the past few centuries. It's an even shorter list -- again, with the caveat that it is based on a subset of all known cometary orbits. This shouldn't really be too surprising, in a way. We (usually) discover comets when they zip through the inner Solar System, since they are both closer to the Earth at that time and intrinsically luminous due to their long tails and bright comae. I included only comets with well-measured orbits in my calculations ... and that means, for the most part, comets which have been observed on more than one perihelion passage ... which in turn means, for the most part, periodic comets. So the winner of this contest will typically be the periodic comet with the largest orbit; and that means 1P/Halley. Halley's comet has a semi-major axis of 17.8 AU, which is still the largest of any periodic comet in the dataset I could find. There are only three other periodic comets with semi-major axes greater than 10 AU, and each of them has been discovered near perihelion in the past ten years; that means that they are all currently near the inner portions of their orbits, closer to the Sun right NOW than 1P/Halley. After doing all this work, I wanted to have a little fun. Suppose that we decide upon this rather silly definition for "The Size of the Solar System:"
The Size of the Solar System is the distance between the Sun and the most distant known body which is gravitationally bound to the Sun. Can you figure out what's happening in this figure? If not, you might glance at an annotated version of the figure. Some of the names you've seen in this document are pretty strange: "1996 PW", for example, or "(26181) 1996 GQ21". What do they mean? Why aren't they sort and sweet, like "Saturn" or "Pluto"? The problem is that lots of objects are discovered each year -- so many that's it is difficult to keep track of them all. Moreover, an object observed tonight might turn out to be the same body measured on another night several years ago ... or it might not. It would be a disaster to give two different names to the same object, or the same name to two different objects. In order to maintain some sense of order, the Minor Planet Center has devised a four-step procedure for giving designations, and eventually "names", to objects within the Solar System. Many astronomers scan the sky, looking for objects which move over the course of a few hours or a few days. After carefully analyzing their observations, they send a message giving the time and location (RA, Dec) of each measurement of each object. As the MPC receives this information, it assigns a temporary tracking number to each one. On a frequent basis, the MPC runs computer programs which look at all the new measurements and try to match each one with other recent measurements, and with the list of all known objects. If some measurement is consistent with the position of a known object, it is assigned to that known object. The half-months of the year run from "A" (first half of Jan) to "Y" (second half of Dec), skipping the letter "I". The first object discovered within a half-month is "A", the second "B", up to "Z" for the twenty-fifth (again, "I" is unused). If more than 25 have been found, the index starts accumulating multipliers: "A1", "B1", and so forth. The multipliers are supposed to be written as subscripts, but I have not done so in the tables in this document (to make it easier for others to use those tables). Once an object has been observed often enough, and over a long enough period, that its orbit is deemed to be "known accurately", the object is assigned a number. The rules for deciding when an orbit is accurate enough are somewhat complex, but require that the object be observed during at least two oppositions. The MPCORB file prepared on 2007 June 29 contains 159,366 numbered objects and 179,077 un-numbered objects. Astronomers often place the number of an asteroid within parantheses in their writings. Thus, they might refer to (1) Ceres or (15788) 1993 SB. The process of assigning an official name to objects can be somewhat contentious. In theory, the discoverer proposes a name and provides a short justification; the fifteen-member Committee on Small Body Nomenclature considers these proposals and, if it approves, makes the name official. In practice, things can get messy, as some people believe that names are very important. Just who is the official discover(s)? What names are acceptable? What happens if someone attempts to give an object a name without going through the official channels? I don't want to go into any detail; interested readers can find examples in the recent past. The Minor Planet Center (MPC for short) is the first place to go when you are looking for information on bodies in the solar system. I used the libnova routines to compute the positions of objects over time. 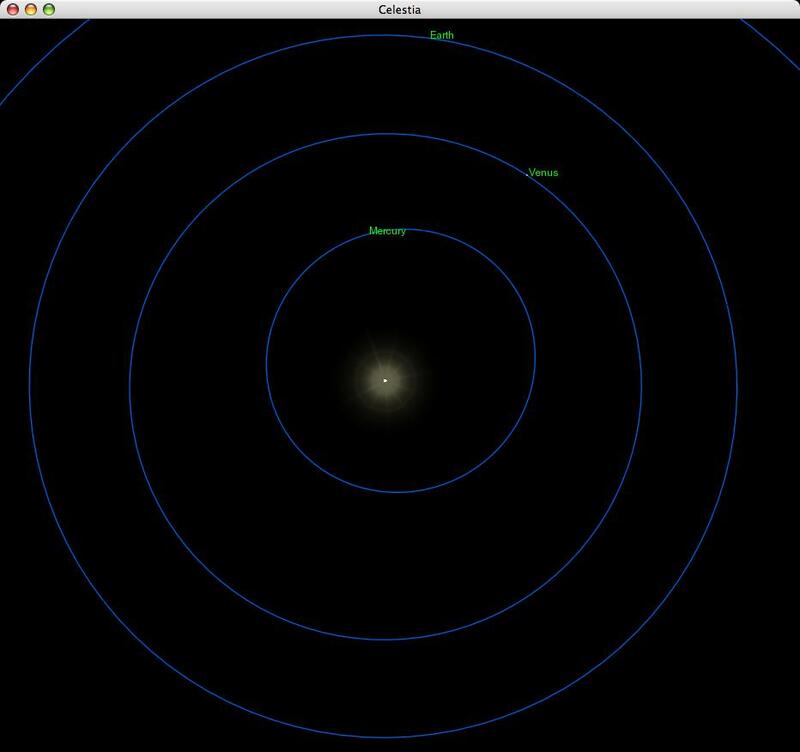 Celestia is a wonderful program for investigating the solar system and making pretty pictures. The Nine Planets website is a great place to go for information on the Solar System. The JPL Horizons system will tell you where objects are in the Solar System to high precision. Wm Robert Johnston's list of Trans-Neptunian Objects collects much interesting information in one place. XEphem is a planetarium program which can create both graphical and tabular output; very handy for making graphs.